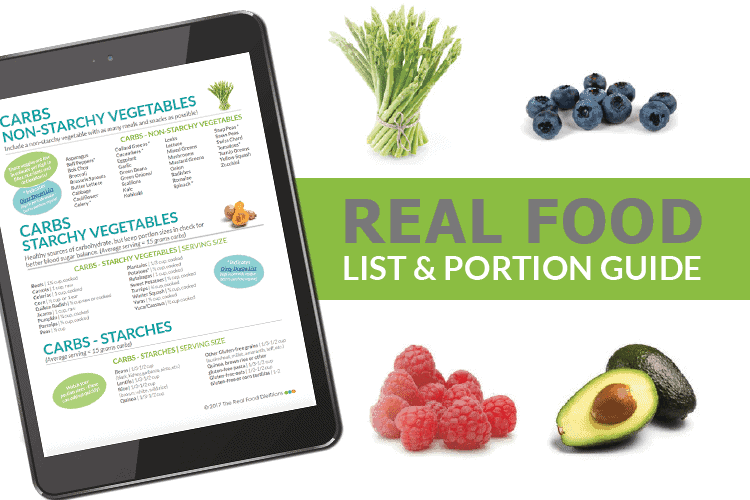 Eat your way to a healthier you with our FREE Real Food List & Portion Guide! With so much conflicting nutrition information floating around these days, it can be difficult to know which foods are the healthiest when it comes to a real food diet! 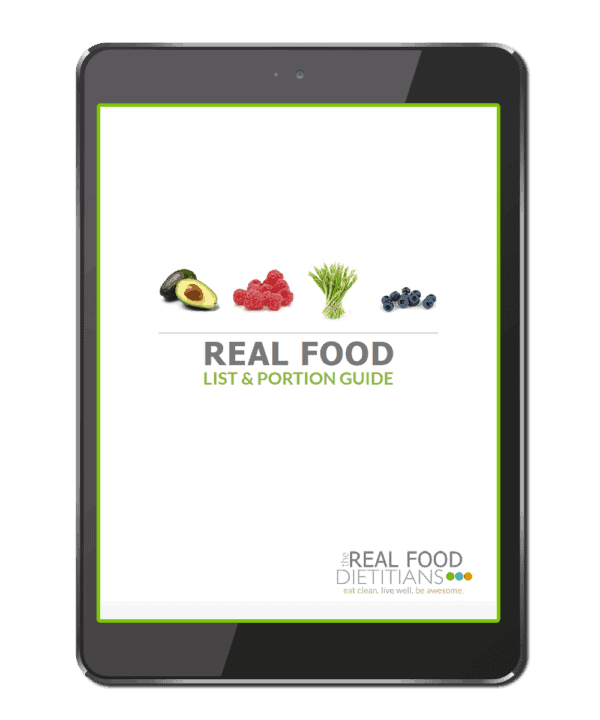 As Real Food Dietitians we get a lot of questions about which foods we consider to be ‘real food’ – so that’s why we’ve put together our Real Food List & Portion Guide, to help you cut through the info clutter and start eating your way to a healthier you. Though we don’t condone calorie counting we’ve included portion sizes for those who are looking for more guidance when it comes to filling their plates. We’ve kept this list pretty general in the sense that it includes dairy, gluten-free grains and some packaged convenience foods because we realize that everyone has different needs and tolerances. What works for you might not work for another so we encourage you to listen to your body and choose the foods that make you feel your best. Note: Our Real Food List is 100% Gluten-free. We’ve selected a handful of pre-made foods for the list that we consider ‘sometimes’ foods because like you, we’re human, and we don’t make 100% of our meals and snacks from scratch. Though we’ve chosen foods with shorter and cleaner ingredient lists, keep in mind that ideally these foods should make up just 10% of your total intake with the rest coming from real, unprocessed and nutrient-dense vegetables, fruits, proteins and fats. CLICK HERE to download the Real Food List & Portion Guide. We hope you find this list useful in your own real food journey and we’d love for you to share this post with anyone who you think would find our Real Food List & Portion Guide helpful! We love FREE stuff! Get our FREE recipe eBook here. This list contains affiliate links, which means we receive a percentage of the sale if you use the link to make your purchase. This does not change the price of the product. This income directly offsets the cost of web hosting, designing fees and maintenance so we greatly appreciate your support.